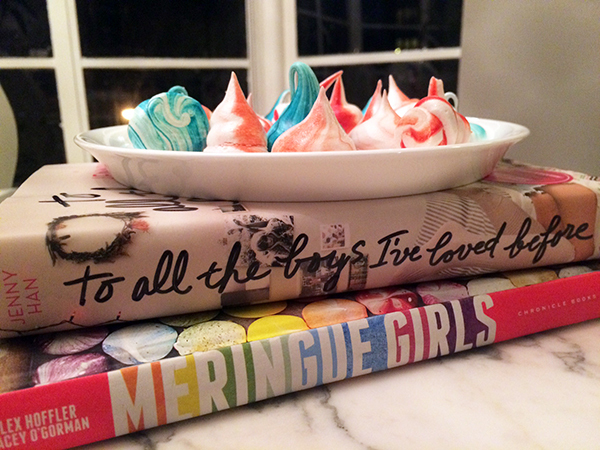 The meringue to sugar ratio is simple. It’s 1 part egg whites to 2 parts sugar. Note: a large egg white weighs 30 g. Use 60 g of superfine sugar per egg white. Remember: Eggs vary in size so make sure to weigh your whites. Use parchment paper to line a rimmed baking sheet. Pour in the sugar and bake for about 5 minutes. Once the edges of the sugar are just beginning to melt, you’re all set. This helps the sugar dissolve in the egg whites faster and create a glossy, stable mixture. 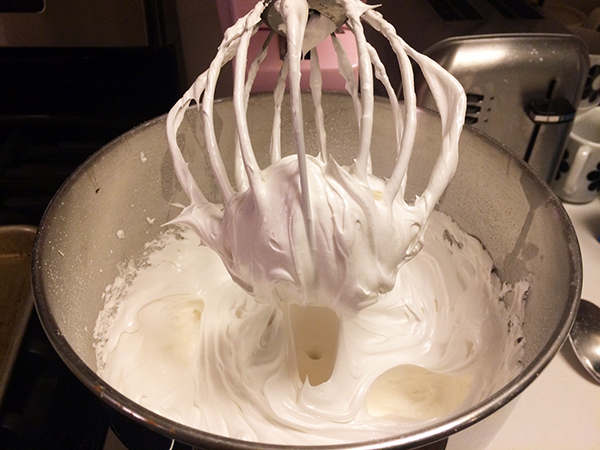 While you’re melting the sugar in the oven, pour the egg whites into the bowl of your stand mixer. Tip: double check that the bowl and whisk attachment are not greased. 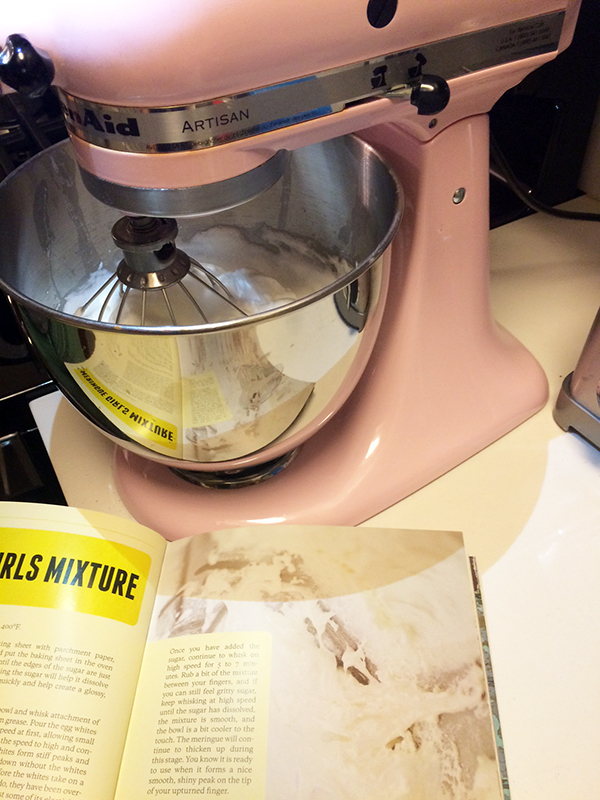 Begin whisking on low speed until you see small bubbles form. Increase the whisking speed to high until the egg whites form stiff peaks and the bowl can be flipped upside down without any of the egg whites falling out. You don’t want the egg whites to take on a cotton-woolly appearance—that means they’ve been over-whisked. Now that the whites are stiff, begin whisking again at high speed and add one big tablespoonful of hot sugar after another to the bowl. Make sure the whites form stiff peaks after each tablespoon. Once you’ve added all the sugar, whisk on high speed for 5 to 7 minutes. If you can feel the gritty sugar when you rub the mixture between your fingers, continue whisking until the sugar has dissolved. You’ll be able to tell when the mixture is smooth and the bowl feels cooler. The meringue will be thickening at this stage. It’s ready to use when it forms a smooth, shiny peak on the tip of your upturned finger. Traditional flavors: chocolate, vanilla, and nuts. Here are a bunch of more daring ideas: hazelnut, lavender, coconut, passion fruit, cinnamon, hot cross bun, pistachio and rose water, green tea, strawberry and black pepper, ginger, manuka honey, raspberry, vanilla bean, and chai. 1. Flip your piping bag (use one with a 7/8 inch diameter) inside out, and invert the bag over a bottle so it holds itself up. 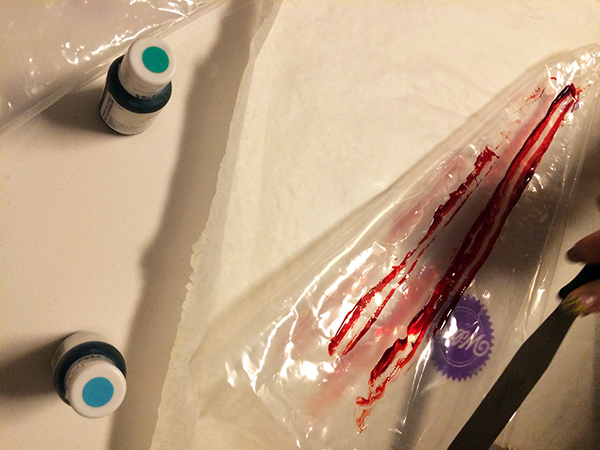 Use natural food coloring and a paintbrush to paint wide stripes from the tip of your piping bag to about midway down. Then roll the bag so the painted side is the inside. 2. 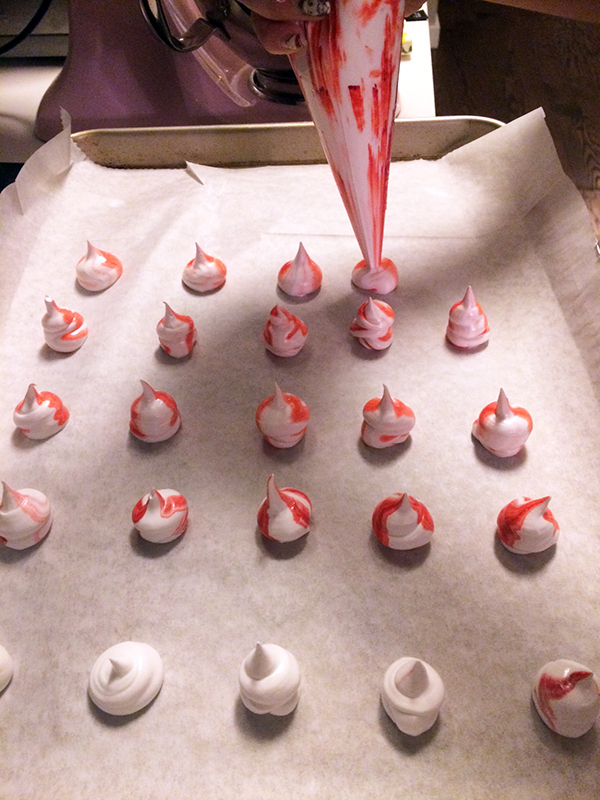 Spoon your meringue mixture into the piping bag. Twist the top of the bag to push the mixture to the bottom. You don’t want any air bubbles. Line baking sheets with parchment paper. 3. Position the piping bag upright with your dominant hand holding the twisted top in place and your other hand placed halfway down the bag. The top hand supplies the pressure and the lower hand controls the flow of the mixture. 4. Squeeze the bag to create kisses with a base of about 2 inches. Form a peak at the top of the kiss by lifting the bag and releasing some pressure. Space the kisses about 3/4 inch apart on the parchment paper. One batch makes about 35 kisses. 5. Preheat your oven to 200°F. Once heated, place the baking sheets in the oven and bake for 30 to 40 minutes. Make sure to place your oven racks in the upper and lower third of the oven. When ready, your kisses should easily lift off the parchment paper with their bases intact. Cool completely and store in an airtight container in a cool, dry place for up to 2 weeks. 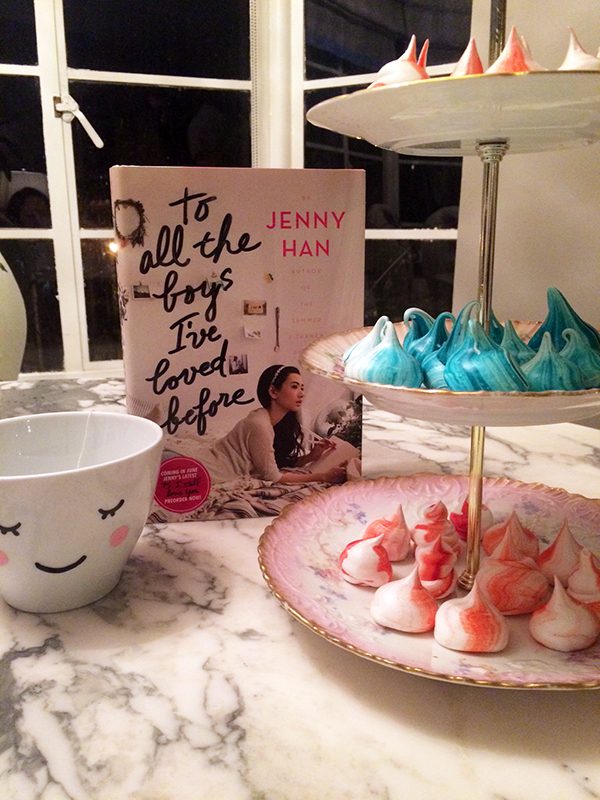 Will you be trying these adorable meringue kisses? 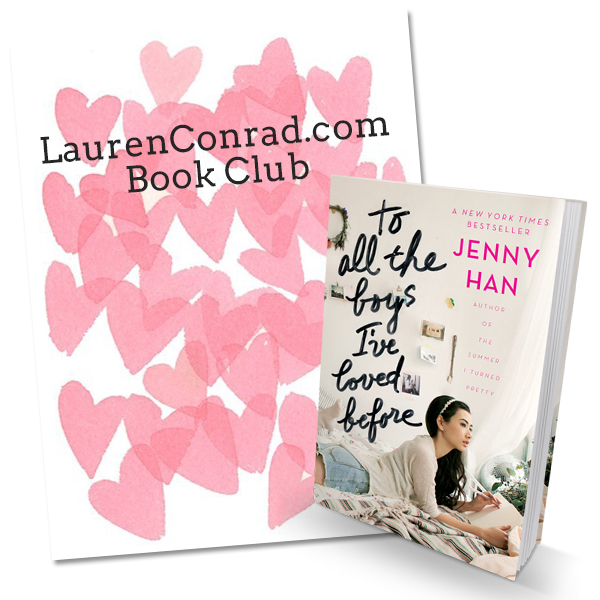 Book Club: My Live Chat for Uganda Be Kidding Me is Today!